FMS Dental is the best dental hospital and Implant Clinic in Hyderabad and the best dental Implant Center in India with top Implantologists in Asia. This clinic offers the best Cosmetic dentist, Orthodontist or Braces Specialist, Paediatric / Child dentist, Oral and Maxillofacial dental surgeon, TMD clinic, Root Canal Treatment specialist, LASER dentist, Periodontist / gum specialist etc. The clinic also has an in-house CBCT scan, CAD-CAM dental Lab offering metal free Zirconium crowns and bridges, dental veneers, laminates etc. LASER Tooth whitening, Smile Designing, LASER gum surgery, Full MouthDental Implants with fixed teeth in 3 days, All-on-4 Implants & Zygoma Implants with hybrid prosthesis, Pterygoid/Basal Implants are performed. 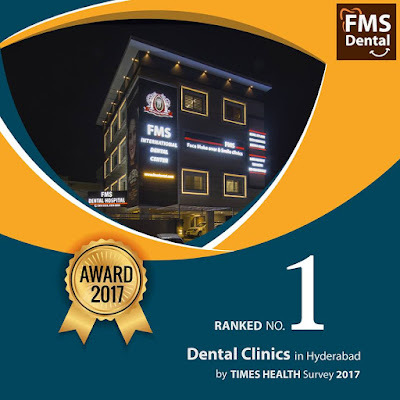 FMS International Dental Center being the best Dental Implant Clinic in Hyderabad exudes great sophistication and ambiance while maintaining OSHA standards of sterilization in all of its 8 operatories. This best Dental Implant Clinic in Hyderabad is in fact now rated as the Best dental center in India and 2nd in the world, according to Global clinic ratings (GCR). With the introduction of new International Dental Centerat Jubilee Hills, FMS Dental is at the brink of setting another bench mark of Dental care delivery in India. This facility is mainly focused on international patients and dental tourism, maintaining global standards in dental care. It is 30 minutes away from the International airport.